We're halfway through summer vacation. At this point the kids have seen all my tricks and are not amused anymore. This is where many lose the battle. Throw in the towel. Set a bowl of Goldfish out, turn the TV on, and leave the room. Not me, of course. Them! It's hard coming up with new things to do everyday to keep the kids entertained. The answer for me is finding ways to "reinvent the wheel". Normal activities with a small twist so that the kids don't recognize their true identity at first. For example, sidewalk chalk. My kids are over it right now. I didn't want to get the sidewalk paint (which they find more exciting since we don't do it as often) out on this given day, so a new version was born. We left out the paint and used paintbrushes on the chalk. Voila! A new twist to sidewalk chalk. First draw, then brush. It gives the chalk a more painted look. This bought me about 14 more minutes to peruse the magazines that came in the mail. Actually, I joined in the fun too. I don't know what compelled me to draw a mushroom. Random, I know. But wait! I see a face in there. Do you see it? This guy looks disgruntled. Good thing it rained the next day. 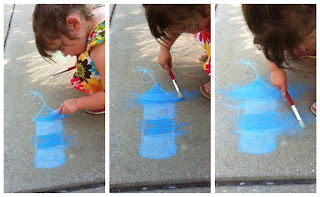 What a cool idea with the sidewalk chalk. My kids are done with the chalk. We tired the paint too and they really liked it, but it didn't last very long. I am in the same place trying to figure out more things to do with them. The hotter it gets the more I don't want to be out, but I have to keep them busy. I think we are heading to Grant's Farm this weekend, we haven't been there all summer, so we need to mark that off our list. Thanks Sarah! I know what you mean with the heat. Mine don't want to do anything outside unless it's the pool. Have fun at Grant's farm! This is a great idea! 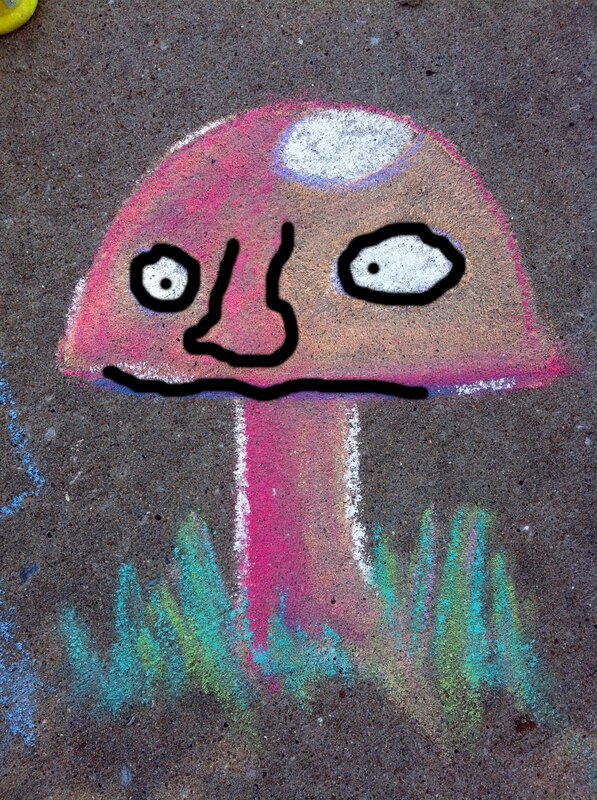 I agree with your assessment of the mushroom. :) It reminds me of a stuffed animal lamb that we have. The sewing give it quite the scowl. We call it "Surly Lamb." Thanks for sharing! Great idea! I would love if you would link it up to my Made by Little Hands linky party. I am visiting from The Girl Creative and I am your newest follower!! 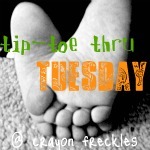 Hope you have a great week and that I see you at my blog sometime! Hi, Charisa! I'm following you now, too. I love connecting with other C(h)arisa's. Thanks for visiting my blog. This is a pretty awesome idea. I love the new spin on a classic.